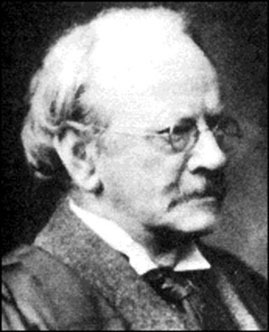 Beginning in 1895 physicist J. J. Thomson theorized that cathode rays produced in Crookes' tubes must be composed of what he called "corpuscles", a single type of negatively charged particle. In 1897, applying his own vacuum technique to the study of these then-mysterious rays, Thomson made a convincing argument for composition based on sub-atomic particles, "this matter being the substance from which all the chemical elements are built up". To make sense of this theory he proposed a "plum pudding model" of the atom, which was debated for several years and disproved by his former student, Ernest Rutherford. Thomson also showed a stream of channel rays could be separated into two or more parts through exposure to electrical and magnetic fields, leading eventually to the invention of the mass spectrograph and discovery of isotopes by another of Thomson's students, Francis W. Aston. Thomson won the Nobel Prize in Physics in 1906, and his son, physicist George Paget Thomson, won the same honor in 1937.